You choose! Any flavor of our 16oz varieties. 2 must be from the dill selection.Please check the individual flavors for ingredients list. From Anonymous of El Mirage, Arizona on 3/14/2019 . Everything was delicious and fresh. Well packaged. Fast shipping. Will definitely order again. From Sharon of Ft. Wayne, Indiana on 12/22/2018 . Sent this to our nephew in Arizona, he loves your pickles! From Ellen of Marion, Indiana on 6/24/2018 . 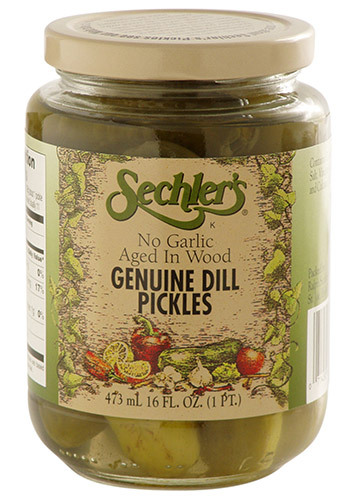 Sechler's pickles are Delicious. Also their sweet pickle relish is hands down, the best you can buy. From Bernice McCarthy of Fort Wayne, Indiana on 5/31/2018 . Sent to Wisconsin- my relatives - they all loved the 4 pack 1/2 dill assortment! It was our response for our pleasant visit to my sister and her family! From Anonymous of Saint Joe , Indiana on 5/20/2018 . We live only minutes from Sechlers pickles and sent pickles for a gift to family in Pa. They could not believe how crisp and delicious the pickles were. Their favorite is the baby dills. Thank you for such a fine job!! !